Get a good harvest in the greenhouse, spending forThis means a minimum of physical effort and, the dream of every gardener. To realize this dream can be achieved by automating lighting processes, watering, ventilation, heating closed buildings. To satisfy the need for greenhouse plants in water, sparingly spending its reserves, allow for drip irrigation systems that you can buy or make yourself. Since ready-made systems are implemented at very high prices, many gardeners are trying to organize in a greenhouse drip irrigation with their own hands. This completely avoid the cost is impossible, because you have to acquire the necessary supplies, individually or bundled. But the money spent quickly pay for themselves by saving water, served on time and accurately in the root zone of cultivated plants. Culture is not experiencing water shortage, develop well and bring a great harvest. Or take a ready-made set for the assembly? 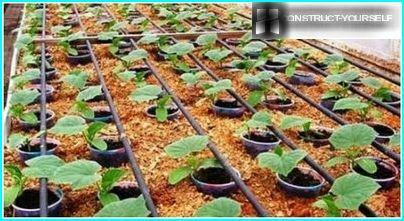 , It is necessary to arrange drip irrigation in greenhousesto provide a slow flow of water through the tubes to each plant with the container situated at a low height. To this end, next to the greenhouse design a tank or barrel, which is raised above ground level at a distance of 1.5-2 meters. From the container is pulled at a slight slant opaque system of rubber tubes with a diameter of only 10-11 mm. 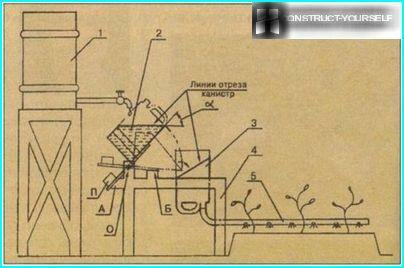 Near the plant in the tube doing a holeand it is inserted into a two-millimeter diameter nozzle through which water will flow to the root system. With the dispenser, automatic sensor faucet, or regulate flow of hot water into a barrel, which helps prevent water overruns and excessive waterlogging of the soil. To build a drip irrigation system for the greenhouse, you can protect the fruit and leaves of many vegetables from unwanted moisture. On the surface of the soil in such a crust is formed watering, the roots can therefore freely "breathe." Spot watering does not grow weeds, so is possible to save power on weeding. It reduces the risk of plants grown in the greenhouse, pathogens and fungal infections. The process of growing vegetables and flowers in the greenhouse passes with the least amount of effort. Compliance with the recommended level and watering norms for each type of plant. Optimum water flow. It is especially important for summer cottages, experiencing difficulties with the water supply. Important! The disadvantages of drip irrigation, organized in a greenhouse with their hands, you can include the need to control water tank filling in the absence of a centralized water supply system, as well as clogging of nozzles. Last drawback is easy to fix, if included in the filter system and the capacity to close tight lid. Greenhouses mounted on the cottage and gardensites usually have a standard length of 8.6 meters. For such small structures can use smaller diameter drip tube (8 mm). 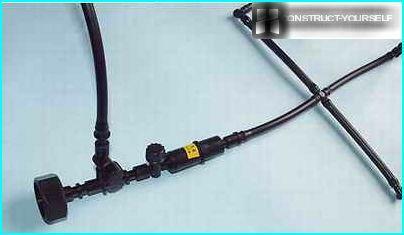 For such thin hoses are available special fittings that facilitate the process of connecting the individual elements of a homemade drip irrigation system. If tubes are used for external droppers, it becomes necessary to buy more thin tubes having a diameter of only 3-5 mm. These tubes are connected outside the dropper tip and through which supply water to the root system of each plant. Due to their conical shape fittingseasily inserted to ensure the integrity of the system under pressure, reaching up to 3 atmospheres. To equalize the pressures to acceptable rates (0.8-2 atm) is inserted in special reducers. The water gets to the roots of plants throughlugs, which may be conventional and labyrinth. First choose when to drip supposed to wear only one tip. The second option is required in the case where a drip chamber is connected via splitters, two or four tip. Before you start putting a drip systemirrigation in greenhouses, it is necessary to plan planting and draw the circuit by putting on it the length of the connecting tubes and intravenous lines connected to them. Then the drawing is prepared the required number of pieces of desired length, which are collected in a single system with the help of fittings. Also purchased additional equipment, which includes a list of mandatory and automatic filter on the grower's request. 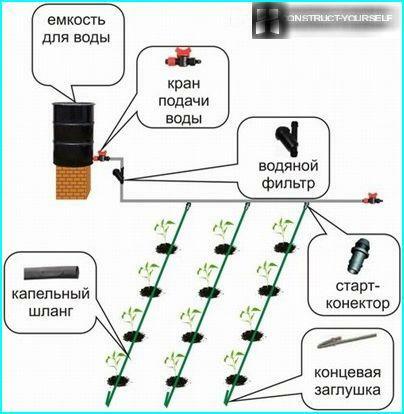 The system of drip irrigation, collected in a greenhouse atcircuit, connected to the water supply or capacity drive with a special adapter fitting-threaded? inches. This adapter or directly connected to a water pipe, or put between filter or connect it to the solenoid crane automation system. Important! The tubes are cut along the length so that the tip hit the root zone of plants. Not every cottager can not afford to constantlyreside on your country site, or go there every day to water the beds. 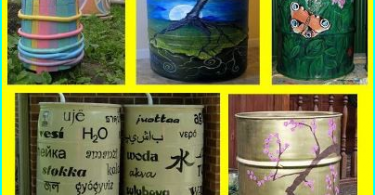 Come up with a variety of home-made design, allow the plant to provide water in the absence of the owners villa. An interesting variant of the device in a greenhouse watering oncountry house with their hands is presented below. Striking design simplicity, availability of materials needed to build it. Large financial costs cottager it does not suffer. 2 - storage capacity; 3 - funnel; 4 - base; 5 - loading pipe. As the capacity of storage and funnelsuse five-liter plastic containers. The top of the canister is cut at an angle. Capacity drive is set at an angle, it primatyvaya adhesive tape to a wooden plank. On the opposite side of the bracket is attached to the counterweight (W). Drive is provided by rotation of the axis (0) between two stops (A and B), fixed on the ground. On the same basis is attached and hopper, which opening is connected to a pipe that is used for irrigation. The water coming out of the barrel in capacity drive,gradually fills it. The result is a shift of the center of gravity of the drive. 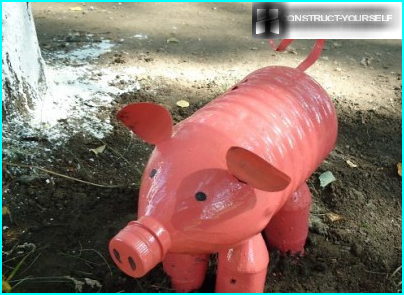 When his weight exceeds the weight of the counterweight, he topples over and water poured into the funnel, and then enters the pipe with holes, paved near the plant roots. Drain the drive back to its original position under the action of the counterweight and the process of filling it with water is repeated. Using regulated valve supplying water to the volume capacity of the storage drum. Important! counterbalance weight, angle drive, the position of the axis is chosen empirically. Work the entire system is manually tuned in the course of a number of pilot irrigation. On sale are inexpensive kits for devicesDrip irrigation, which contain all the necessary elements to build an irrigation system except filters. Therefore, the filters need to buy separately. Header pipe 25 is made of polyethylene-mm pipes that are sturdy, lightweight, do not corrode. In addition, their walls are resistant to liquid fertilizers, which can be supplied to the plants by watering system. The process of installation of the system is described in the manual, which is applied to the set. The thick walls of the main drill pipe14-mm hole into which is inserted using a gum-seals, starters for irrigation. For starters put on drip tape measured length. Tips drip tape covers caps. To do this, cut the tape from each five-centimeter piece, which is then put on her twisted end. 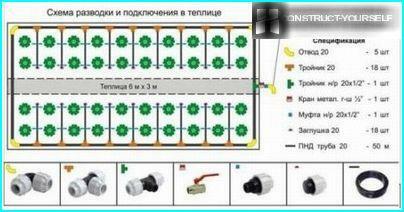 To process the greenhouse irrigation became automatic, you need to install electrical controllers, powered by batteries. Service collected drip irrigation system is reduced to the periodic cleansing the filters. According to the collected drip irrigation system for eachplant will be delivered to the same amount of water. This must be considered when planting crops, picking up plants in the group, characterized by equal water consumption. Otherwise, some cultures will receive an optimal amount of moisture, while others - in excess or, conversely, the lack. To gather the drip irrigation system is beststart at the end of winter. Having made planting plan, and collecting system in accordance with the scheme prepared, it can be mounted in the greenhouse after transplanting. Using ready-made kits, sold in specialized gardening stores to make their own hands drip irrigation system under the force of each summer resident. Thus, by introducing new irrigation technology grown in a greenhouse, it is possible to achieve good crop yields and reduce the amount of effort spent on caring for suburban plantings.